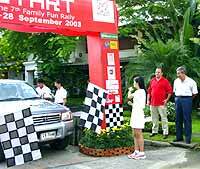 For the 7th consecutive year, the Amari Rincome Hotel, in cooperation with the Angkhang Nature Resort, jointly organized the famous Family Fun Rally last weekend. Almost like the real thing - Somjet Nimmanhemmin (far right) and Win Fagel, Amari Rincome’s new GM, are watching the flagging-off. It was business as usual at 8 a.m. on Saturday when Somjet Nimmanhemmin presided over the opening and the drivers were flagged off and ‘on their wheels’. The various teams could easily be distinguished by the matching colors of their shirts, whereby the famous (or infamous) ‘RRs’ (Rincome Racers) tried to make a point by sporting a very Ferrari-like red polo. Or did they simply try to scare off the competition, I wonder? Anyway, in most of the cases, team orders were strictly adhered to, and a great number of not-so-serious tasks were to be taken care of on the way. Phew, we made it - it’s good to finally see the word “Finish”. The teams had to challenge themselves with various auto racing puzzles, such as composing songs, finding names of tribes and villages, and a lot of other silly things which you can only do in a car. As this rally is known to be a rather scenic one, the outdoors as well took a great part in the games. 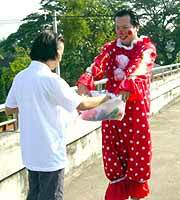 Before lunch was served at Phrao Vittayakom School, beautifully arranged and catered by the Amari Rincome, the participants had to watch out, for example, for a fully-dressed clown standing on a flyover bridge. But it was certainly not good enough to just spot him, one also had to obtain a little token from him, as evidence. 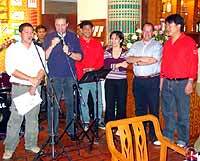 Participants and staff used the opportunity to bid farewell to Marc Dumur - from left Makoo, GM Angkhang Nature Resort, Marc, Sales Manager Toi, new Amari GM Wim Fagel and his Executive Assistant “Jeff” Chanin. Then, a few kilometers further down the road, there were bicycles prepared, and the teams had to hop on one, take a plate with ping-pong balls in one hand, and carefully balance them through a quite tough course, much to the enjoyment of the onlookers (and a number of local residents who weren’t quite sure what was going on there...), and cheered by the other teams in order to create a distraction - in most cases successfully. Nothing but us - are WE lost, or are the other teams? After more afternoon challenges, the teams approached the Norlae Military Camp, where the real challenge began, performing everyday jobs such as packing up military gear in a rucksack, putting bullets in magazines (blindfolded, of course), and setting up army tents. Obviously, everyone was relieved to finally see the “Finish” banner, prominently placed across the main entrance to the Angkhang Nature Resort, just 6 kilometers away from the camp. This picture does not really need an explanation - one of the many activities the teams had to perform on the way. The evening brought a well-deserved dinner, after which the prize-giving ceremony took place. Vichit, director of the Royal Project, personally handed out the prizes to the winners and runners-up, as well as the booby prize for the team which completed all tasks but came in last. All 85 participants relaxed to the sounds of Daeng Fantastic and his Band, and the sound of music only faded out in the wee hours of the morning. One out of 33 participating cars didn’t make the steep and tight curves, and had to be salvaged by some male guardian angels. One of the quite unusual sights on the way to Doi Angkhang was a full-fledged clown standing on a footbridge. A balancing act - grab a plate full of ping-pong balls, hop on a bicycle, and follow the odd course. All teams, a total of 85 persons including 13 children, posing just before the start last Saturday. In order to get rid of the calories accumulated during lunch, groups of 15 were chained to each other for a ‘hare & hounds’ through the woods. On September 24, the Faculty of Medicine, Chiang Mai University (CMU), celebrated Mahidol Day, being the day when Somdej Phraborom Rajachanok (the King’s father) died. He was called the ‘Father of Thai medicine’ and his work in public health remembered because he was the first to bring the new technologies in medical treatment into Thailand from overseas. 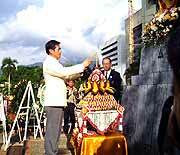 Prinya Panthong, deputy governor of Chiang Mai, presided over the ceremony with officials and students from other faculties, such as the Nursing Faculty, Pharmacy Faculty, Veterinary Faculty, Associated Medical Science Faculty and Dental Faculty of CMU laying wreaths at the of Somdej Phraborom Rajachanok monument. Other activities were organized to mark Mahidol Day, including a mini marathon competition, exhibitions from each faculty, blood donations, poetry contest and a logo-design contest. Even a seminar was held on the topic “Following the Footsteps of the Father”. The Far Eastern College in cooperation with the Department of Industrial Promotion, Ministry of Industry agreed to assist in the development of small and medium enterprises (SME’s), being an important factor to boost the northern region’s economy. The happy ending after a tough contest. Congratulations to all the winners. The seventh from left is director-general Sumolmalaya Kalyasiri, and next to her is Deputy Governor Prinya Parnthong. “This incredible cooperation between government and private sectors aims to help build a strong potentiality for entrepreneurs for the sake of the Thai economy,” said Sumolmalaya Kalyasiri, director general of Industrial Promotion. 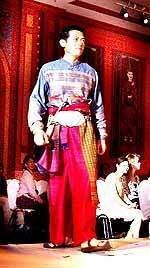 Chiang Mai Deputy Governor Prinya, an honorary model who appeared in a splendid Thai silk evening gown, looked handsome on the catwalk. The Entrepreneurship Research & Development Center (ERDC), founded by Far Eastern College, will be a “Gateway for Entrepreneurship”, providing services in human resource development, information analysis and consultant services. At the conference, Prinya Parnthong, Chiang Mai deputy governor, and Sumolmalaya Kalyasiri, presided over the ‘Chiang Mai Young Designer Contest 2003’ which was held by the Department of Industry as a part of the SME’s development plan, attracting many local creative young designers to present their works. The contest was aimed at bringing a new vision of Thai silk to become more fashionable and more internationally recognized. It was divided into two categories: business suit and evening gowns. A gorgeous model in an elegant Thai silk business suit. 10 finalists were chosen in each category and a fashion show ended the night with 20 local models on the catwalk. The winners on the night were Siraporn Thipprai, the winner of the business fashion suit and Nantiga Haemsart, the winner in the evening gown category. Both received a cheque for 10,000 baht and a certificate. Siraporn, who has been working for Aueng Doi Design as a teacher for the last nine years, said that she was very excited to win. “I spent two weeks designing and tailoring my dress. It’s so amazing that I won,” she said excitedly. The winner of evening gown, Nantiga Haemsart with a big cheque of 10,000 baht and a certificate from Director-General Sumolmalaya (left) of the Industrial Promotion Department. The winner of business attire, Siraporn Thipprai (right) from Aueng Doi Design receives a cheque for 10,000 baht and a certificate from Sumolmalaya Kalyasiri (left). Sumolmalaya Kalyasiri (left), director-general of Industrial Promotion Department exchanges an MOU with Associate Prof Boonsong Nilkaew (right), president of Far Eastern College, as Chiang Mai Deputy Governor Prinya Parnthong (center) and others look on. Last Friday seven international schools gathered at Prem’s Olympic sized pool for a day of fierce competition and fun in the sun. 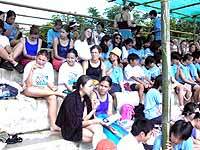 The CMAC swim meet for juniors was held Thursday at Lanna International School. With the combined scores of both the junior and senior swim meets, Prem came out in first place with 886 points. Grace International School placed second with 671 points and CMIS came in third with 359 points. A race in full splash! There were several outstanding performances at Friday’s senior meet. In the 16-up boys, Elliot Krayer (CMIS) swept the 50m freestyle, 50m breast, and 50m butterfly to place first overall in the category with a total of 30 points. Ryan Collingwood (GIS) was not far behind with a total of 27 points. In the 16-year up girls, Hseng-Tai Linter (Prem) had an amazing showing, placing first overall with 21 points, followed by Juntra Santithrangkun (Prem) with 16 points. I’ve made it! Hseng Tai Linter from Prem International had an amazing showing, placing first overall with 21 points. Melanie Forbes-Harper (Prem) stunned the crowd by sweeping the 50m freestyle, 50m breast, 50m backstroke, and 100m freestyle to place first in the 14-15 girls category. Patric de Vos (CMIS) once again won all his races, coming in with a maximum point score of 32 followed by Nick Laine (Prem) with a score of 25. Mel and Nick from Prem International School receiving the overall trophy. In the 12-13 boys category, Andrew Brooks (Prem) performed extremely well, winning both the 50m and 100m freestyle and placing equal first in his age group with Paul S. (GIS) with a total of 28 points. 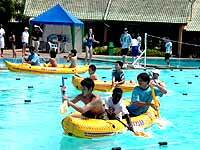 In between the excitement of the races, parents and students from the participating schools mingled, enjoyed the good weather, and cheered on their schools in the more playful kayak races. 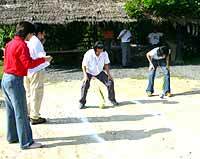 Among students and fans alike there was a sense of competition, but also of genuine enjoyment of the event. Louis and James (in the front from Prem) anxiously await the start of their race. Pure fun and getting rid of the leftover energy in the 14/15-year-old boys kayak race. Matt the tireless announcer, still in a good mood after many hours in the heat (but it’s beginning to show). Paul. S. from GIS and Andrew Brooks from Prem, joint first place in the 12/13-year-old boy’s age group. Waiting for the start, watching, chatting or just eating - all had a good time. 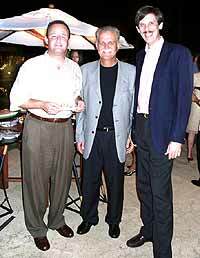 The Amari Rincome Hotel welcomed their new management with a poolside party. Marc Dumur, GM for the last 7 years, introduced his successor, Wim Fagel, whom he has known for the last 20 years, as they once worked together in a hotel in Amsterdam. He thanked everybody for their support and asked them to assist Wim and the Amari team to settle in. New GM Wim Fagel has spent the last four years in Nepal. He said he was looking forward to meeting all the staff and exploring Chiang Mai and the North. Wim then proposed a toast to all the guests, who are the most important part in any hotel. Without faithful guests a hotel cannot function and so he promised he would do his utmost to provide the same high-quality service which his guests had received from Marc. Having a good time (from left) Kittipong Soonprasert, project manager of BBC World Service, Victoria Nimmanhaeminda from NOHMEX and Ricky Op de Laak. The ‘welcome committee’ and guests (from left) David and Wanna Thomas from ‘Wanna Tours’, Marc Dumur, incoming GM Wim Fagel, exec. assistant manager ‘Jeff’ Chanin Sattayarom and sales manager Toi. International tensions are not seen in Asia. 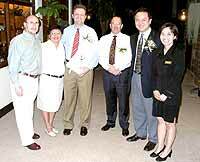 (From left) Consul General to the United States of America Eric Rubin, Hon. Consul to the Federal Republic of Germany Hagen Dirksen and Hon. Consul to France Thomas Baude. One of the beautiful Lanna Dancers at the poolside. 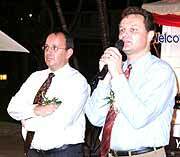 Marc Dumur (right) makes his last speech as GM before handing over to his successor, Dutch national, Wim Fagel. There has been a big stink lately in the tangerine and orange groves of Chiang Mai Province, and renewed concerns of pesticides polluting the air and streams from heavy use in agricultural crops. Perhaps it is long overdue for farmers and agencies that are missing the boat, to get in touch with modern plant science and the systems of integrated pest management, plant health care and permaculture. MaeJo University soil scientists at work. Comprehensive soil fertility analysis is essential to PHC. Soil structure, pH (acidity/alkalinity balance) of the soil and water supply, soil organic matter content, salinity, mineral and nutrient levels should be scientifically established and corrected for optimal health of the specific plants being grown. Integrated pest management (IPM) is the science of comprehensive management of pests and disease in plants, both in agricultural settings (field, vine and tree crops) and in ornamental/environmental plantings. IPM is a major component of plant health care (PHC), a system of horticultural maintenance that takes into account all aspects of soil and plant health, not only pest control. Permaculture encompasses all of PHC plus intelligent land planning with ecological farm and community design. In established plantings, a PHC maintenance program would include regular monitoring inspections by a PHC/IPM specialist knowledgeable in local conditions and seasonal cycles. Recommendations would be made for ongoing plant nutrition, irrigation, pest control and pruning needs. Or in some cases inspections would establish that nothing is needed at the time. IPM, once considered an “alternative” to chemical pest control, is now mainstream practice in some countries for large-scale commercial agriculture as well as small organic farms. After 30 years of development and extensive scientific research, IPM has proved itself in pest control effectiveness, monetary savings and beneficial environmental impact. 1. Study and understand nature and the delicate balances that exist between interrelated systems of climate, soil, plants, microorganisms, insects, pathogens, animal and human activity. 2. Use plants that are best suited to the environment in which they are to be grown, and use plant varieties that are known to be resistant to specific pests and diseases. 3. Provide optimal cultural conditions; proper planting, spacing, soil fertility, water and management. Use crop rotations, inter-cropping and reduce mono-cropping. 4. Know which pests and diseases are most likely to affect these plants. 5. Closely monitor pest activity, know the lifecycle of each pest, cultural conditions and natural enemies that affect pest activity. 6. Tolerate minimal pest activity and recognize that natural predators of pests may keep pest populations and plant damage under control without the necessity of intervention. Don’t kill off natural enemies of pests with broad-spectrum pesticides. 7. If unacceptable plant damage is anticipated from increasing pest activity, only then introduce control measures. 8. If necessary to control pest or disease activity, utilize control measures that are least detrimental to the environment and the natural balances that exist. Many plant insect pests are controlled naturally by birds and other insects and organisms that eat them or parasitize them. Extensively studying these relationships between specific plant pests and their natural enemies has led to the development of biological control awareness and commercially available biological control products. Many fungal and bacterial plant diseases are more active under cultural conditions that favor them, like over-watering, and poor soil conditions. Correcting these conditions may bring the disease under control and eliminate the need for chemical applications that are costly and environmentally damaging. An example of IPM at work: Aphids are small insects with piercing, sucking mouth parts that feed on the leaves and stems of plants by sucking the plant juices for their own nourishment. They are one of the most common pests in agricultural field and tree crops as well as in ornamental landscape plants. A limited amount of aphid activity may be tolerated, but excessive feeding can weaken plants, distort plant parts and limit crop productivity or ornamental plant value. An IPM specialist facing an aphid infestation looks at several factors. One is that in some cases, excessive nitrogen fertilization can create a higher sugar content in plants and make those plants more susceptible to aphid feeding and a higher level of damage. So one cost-effective control measure could be to reduce nitrogen fertilization to only what is necessary for optimum plant growth. The result can be a multiple savings: reduce cost of fertilization, reduce crop damage and reduce cost of pest control. The IPM practitioner studies entomology and knows the lifecycle of an aphid, the stages of growth, natural enemies (including lady beetles and lacewings that eat aphids and mini-wasps that parasitize them) and protectors (ants protect aphids from some predators so they can feed on the sweet honeydew that aphids secrete). This knowledge is important so that first of all the farmer doesn’t overreact when he sees the first sign of aphids and kill off the natural enemies with a strong pesticide, and second so that he can work to enhance natural controls with cultural methods or the introduction of biological agents (like lady beetles, lacewings or specific wasps). The beauty of supporting natural predation is that it is often a one-time effort. Some pest predators, after introduction, remain in the environment to do their thing year after year; if they are not killed off with pesticides that is. Horticultural oils are also used in IPM, with the correct timing, as a relatively non-toxic spray, the thin oily residue of which smothers eggs, and over wintering insects. Another example of biological control is the use of Bacillus thuringiensis (BT), a bacteria that infects and kills the larvae of some insect pests. Spraying of a concentration of BT for a specific chewing caterpillar infestation, with the correct timing, can significantly reduce the pest population and damage, without poisoning other organisms. There is currently research underway for the development of the use of a BT strain for mosquito control. Phytophora is a fungus-like organism called a water-mold. Among the many species of Phytophora are some of the most destructive plant diseases in the world. Certain Phytophora species are the disease organisms attributed to “late blight of potatoes” and the Irish potato famine of 1845, crown and root rot of avocado and citrus, and sudden oak death syndrome among other epidemics. Some Phytophora species thrive on over-wet soil conditions or soil piled up at the base of a plant (including trees). In poorly drained soils that are over-watered and can’t dry out, the water-mold organism thrives and infects the stem of the plant, causing the gradual destruction of conductive and support tissues. Phytophora can weaken and kill small plants or big trees. An imbalance in soil chemistry can predispose the plants to infection. IPM for Phytophora would involve first looking at plant selection in relation to disease susceptibility and soil type, performing a soil analysis and correcting pH and other factors. And then make recommendations about watering frequency and perhaps clearing excess soil away from root collars. IPM practitioners know that a little knowledge, foresight and prevention are a lot more effective and economical than pest and disease intervention after the infestation or infection is established. The IPM oriented grower can decide to be a strict “organic” grower (IPM and soil fertility based with strictly no synthetic chemical fertilizers or pesticides/fungicides/herbicides), or to use relatively low toxicity chemicals against the target organisms, consciously as a last resort. Plant Health Care (PHC) has evolved from the IPM approach as the most modern and comprehensive science of plant health management. IPM is a major component of PHC, but PHC goes further to encompass all aspects of soil and plant health, not only pest control. PHC first looks at plant selection for a given location. Or the other way around, to select a suitable environment for a particular planting, where it will thrive with minimal obstacles. First look to the plant’s native habitat for clues. Proper timing and methods in planting are important. Although controversial, genetically modified plants would be considered by some agriculturists in utilizing pest resistant varieties. Comprehensive soil fertility analysis is essential to PHC. Soil structure, pH (acidity/alkalinity balance) of the soil and water supply, soil organic matter content, salinity, mineral and nutrient levels should be scientifically established and corrected for optimal plant health of the specific plants being grown. In established plantings, a PHC maintenance program would include regular monitoring inspections by a PHC/IPM specialist knowledgeable in local conditions and seasonal cycles. Recommendations would be made for ongoing plant nutrition, irrigation, pest control and pruning needs. Or in some cases, inspections would establish that nothing is needed at the time. The big picture provided by comprehensive plant health care and its component integrated pest management is the height of modern plant science for agriculture and environmental horticulture. PHC and IPM are not limited to the realm of laboratory science and university research, but in addition to knowledge gained from these areas, a true PHC specialist has cultivated an understanding of nature and natural environmental systems, a love of plants and soil and all the organisms that live in and around them, and respects how they interrelate. Permaculture is a parallel discipline that incorporates plant science and organic farming, but is much more than that. It encompasses the basics of PHC and IPM plus goes more into depth in areas of land planning, designing community, farm and residential integrated environments, and preserving ecosystems. IPM, PHC, and Permaculture specialists should be the ones enlisted for devising alternative approaches to heavy pesticide use. Any view short of what these systems provide will ultimately fail in satisfactory long term solutions for the farmers who need to control damage to their crops and at the same time insure a healthy environment for all the people and other creatures downwind and downstream.